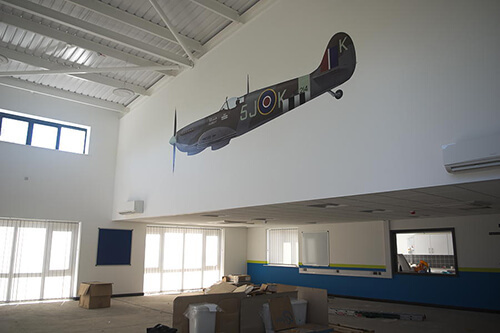 Signs Express (Nottingham), who produce and fit a variety of large format display graphics and signage, has completed the print and installation of an impressive graphic display of a Spitfire for 126 City of Derby Air Training Corps’ brand new Squadron building in Alvaston in Derbyshire. Jane Bailey, who is director and co-owner of Signs Express (Nottingham) along with her husband, Adam, is a Civilian Instructor for the Squadron, so when they were looking for someone to print and install the image, it made sense for Jane and Signs Express to take the job on. 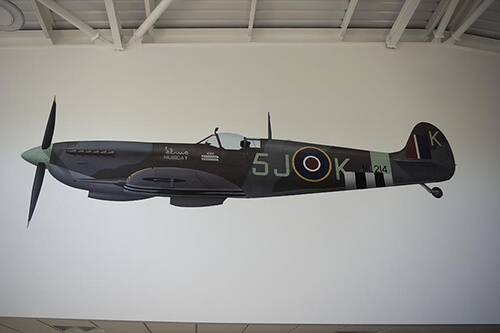 The six-metre wide graphic depicts Spitfire Mk IXc ML214 ‘5J-K’, which was flown by Commanding Officer Squadron Leader @Johnny@ Plagis DFC DSO in Operation Overlord, during the D-Day invasion in June 1944. The image takes pride of place high up on a wall in the Drill hall where the Cadets meet. Jane explains: “Because of the size and position of the image, and because we wanted it to have longevity, we needed a product that we could feel confident would ‘grab’ the wall and stay there”. Because all wall vinyls have the potential for adhesion failure, Signs Express tested wall vinyls from several suppliers before making their decision. The test involved both heating the vinyls in and applying them normally. Antalis Account Manager, Rob Hill, gave Jane a sample of Drytac Polar HiGrab to try, and it stood out from the beginning. To be sure they were choosing the best product for the job, a second round of tests was done, this time applying the vinyls to a sample area of the wall to which the final job would be applied. Again, Drytac Polar HiGrab came out top. Jane comments: “As well as ‘grabbing’ the wall extremely well, the great thing about Drytac Polar HiGrab is that it doesn’t require lamination, making the job cheaper, easier and less likely that mistakes are made. It’s also given us even more confidence to go out and sell a wider range of wall vinyls to our customers. While all wall vinyls ‘grab’ initially, occasionally they can fail after a period, but we just haven’t had that problem with the Drytac product”. Drytac Polar HiGrab is a printable white monomeric PVC film, coated on one side with a high-tack, pressure sensitive solvent grey opaque acrylic adhesive, protected with a Kraft release paper. Its exceptional adhesive properties enable it to adhere to a wide range of surfaces, both indoor and outdoor, including painted walls (as was the case here). 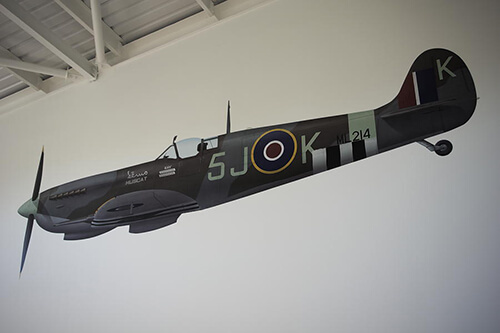 Fitting: Signs Express used their platform tower scaffold, tape for hinging, 3M squeegees, and a lot of patience, due to the shape of the Spitfire; its length made it very challenging as the fitters were up a five-metre scaffold with six metres of vinyl to run along the wall. Tip: Jane Bailey advises: “It’s worth taking the time to test and double-test products thoroughly before using them”. Signs Express are delighted with the finished result, but will have to wait until after the new premises open in late Autumn 2017 to see the reaction of the Airforce Cadets.